The Deben Peninsula is located in Suffolk between the Deben River to the South and the Alde & Ore Estuary the North. It has a unique charm and varied natural beauty, its coastal heathlands contrasting with the undulating farmland to the west. 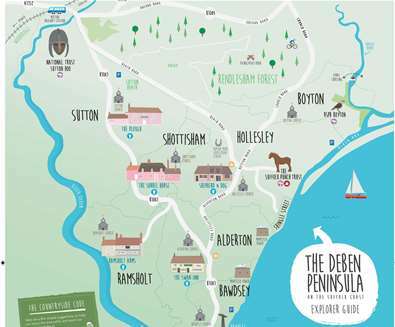 Exploring the Deben Peninsula you'll find picturesque villages including Sutton, Shottisham, Hollesley, Boyton, Alderton, Ramsholt and Bawdsey. The landscape quality of the area has been recognised nationally by its designation by the Countryside Commission as an Area of Outstanding Natural Beauty. The significance of the Deben Peninsula coastline and estuary is further recognised as forming part of the Suffolk Heritage Coast and the upper reaches of the Deben River designated as Special Landscape Areas. The area is also important for nature conservation and heritage with un-spoilt natural habitats and national heritage sites including, the Worlds First Operational Radar Station at Bawdsey, National Trust Sutton Hoo and The Suffolk Punch Trust.